World Tobacco Day is annually observed on May 31 with an aim to draw people's attention towards the hazardous effects that come with the consumption of Tobacco. World No Tobacco Day was started by World Health Organization (WHO) in 1987 to spread awareness about the dangers of tobacco consumption. 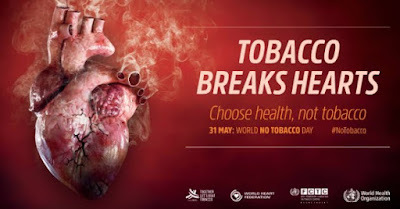 WHO has joined hands with World Heart Federation to highlight the connection between tobacco and cardiovascular diseases (CVD) that are the world’s leading causes of death, responsible for approximately 17.9 million deaths annually. When is World No Tobacco Day observed? What is the theme of World No Tobacco Day 2018?